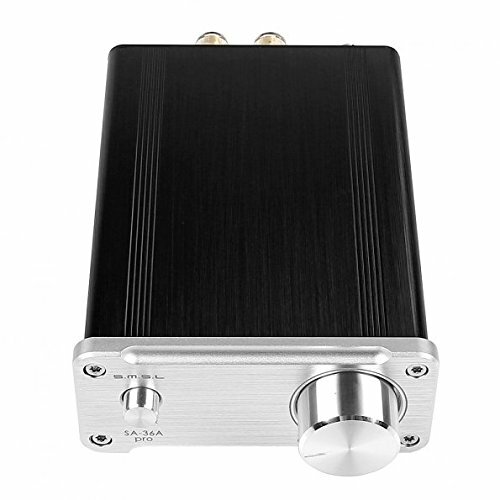 SMSL Big Power Digital Integrated Tripath Stereo Amplifier with 12V 3.8A Power Adaptor. This S.M.S.L high grade amplifier has advanced aluminum surface, plus sand-blast, wiredrawing, oxidation, and laser engraving craft, it becomes more stylish and attractive than others. SA-36A Pro is Texas Instruments TPA3118D2DAP as the core, equipped with high-quality advanced digital amplifier EPCOS, Panasonic, TDK, TI, AV, PYCOS subtle accessories. It's very small in size so that you can put it on your computer desk to enjoy your favorite music freely. Surface craftsmanship: sand-blast, wiredrawing, oxidation and laser engraving, never fade like paint spraying. Power: 25W, 4Ω/ 20W, 8Ω. Signal input: RCA golden-plated lotus input. Signal output: 4 line signal output. Power supply: DC12-24V, external diameter: 5.5mm (-), heart diameter:2.1mm (+). Circuit material: 1.6mm thick all glass fiber, IMG. Dimension: approx 150 x 92 x 43mm/ 5.9 x 3.6 x 1.7". Amplify the sound while listening. background music, small supermarket or office music, etc.